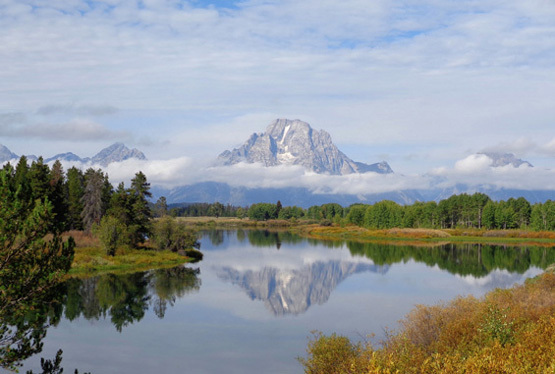 fresh-water ponds, old fields, and forests." 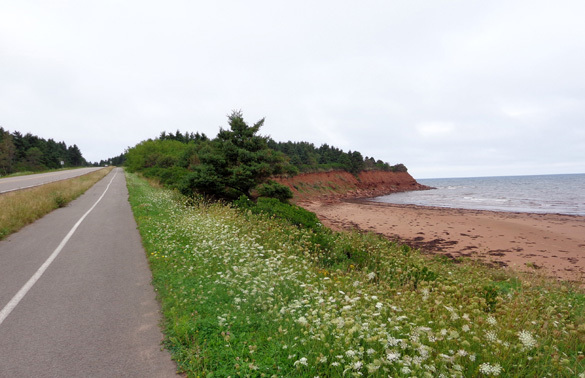 and riding our bikes along the last convenient section of trail on the island we know about that lies close to the Gulf of St. Lawrence. 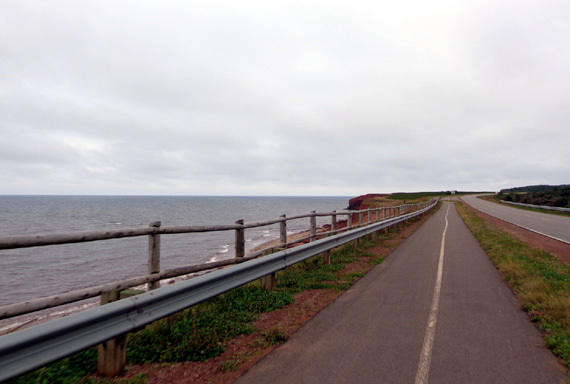 Last Wednesday we rode a beautiful section of Gulf Shore Way in the Brackley-Dalvay unit of PEI National Park. When we woke up at the campground this morning we could tell that quite a bit of rain fell during the night. It was still misty and totally overcast, with a 40% chance of more rain during the day. We weren't sure that it'd be a nice enough day for this bike ride. 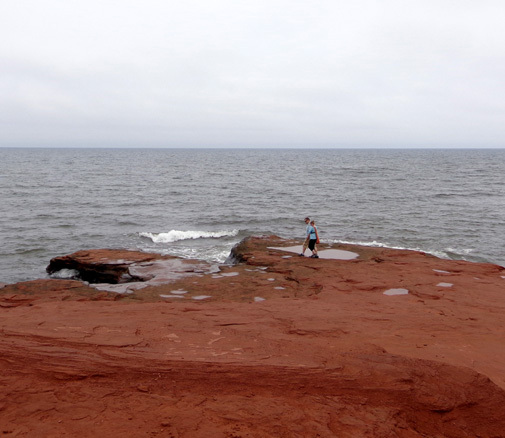 We really wanted to end our trip to PEI on a high note. We waited until about 11 AM to leave the campground. Our optimism re: the weather paid off. 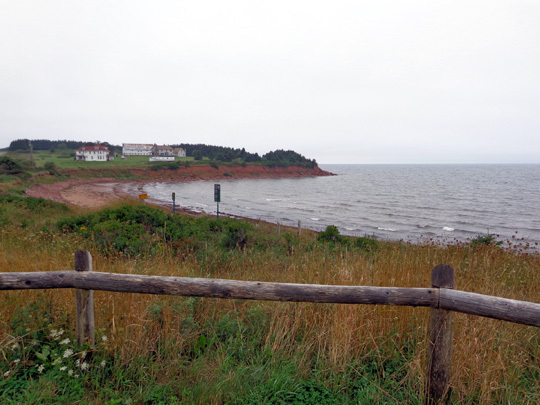 After eating our fabulous chowder and steamed blue mussel lunch at Rustico Harbour, the fog dissipated and the clouds weren't so low. It never did get sunny while we were cycling but the scenery was so awesome that we thoroughly enjoyed our ride. 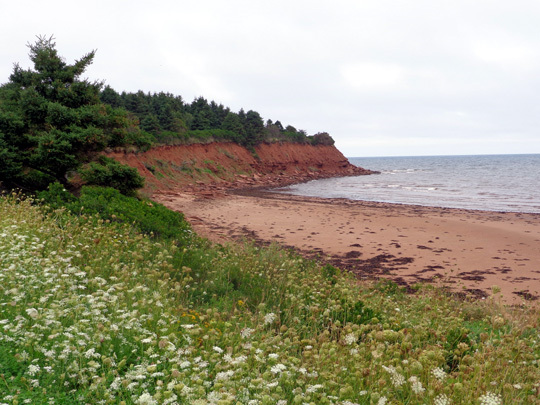 Lots of flowers, red sand, and red cliffs along this section; this cove is near where we parked. 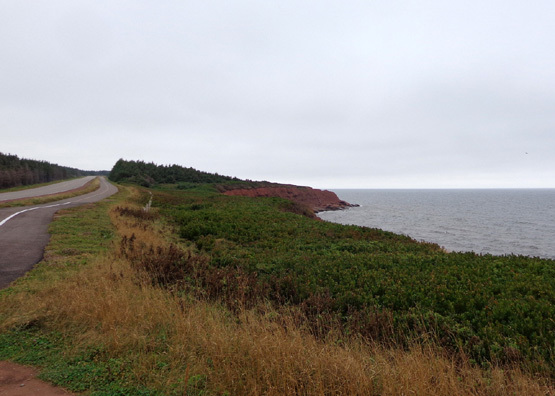 We found the nearest entrance to the Cavendish unit of the park by driving north about a mile from North Rustico on Church Hill Rd. I took this photo at the end of my ride as I approached the parking area in the distance. 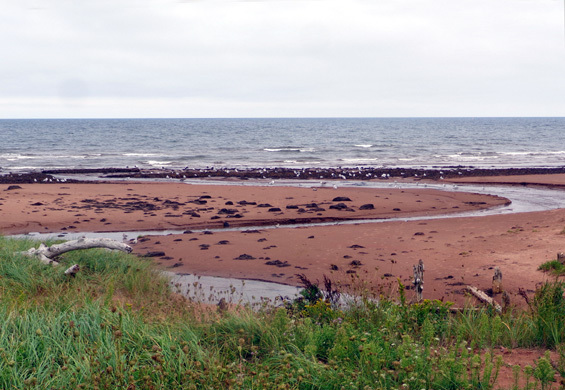 Above and below: This little creek outlet and a flock of hungry seagulls were across from the parking area. 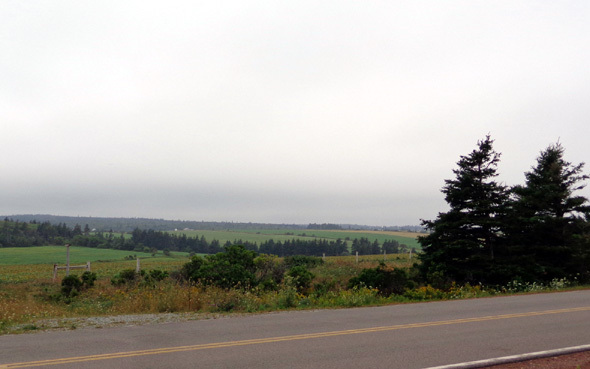 We rode our bikes west toward Cavendish at our separate paces. I stopped frequently for photos and went into every overlook to read the interpretive panels. 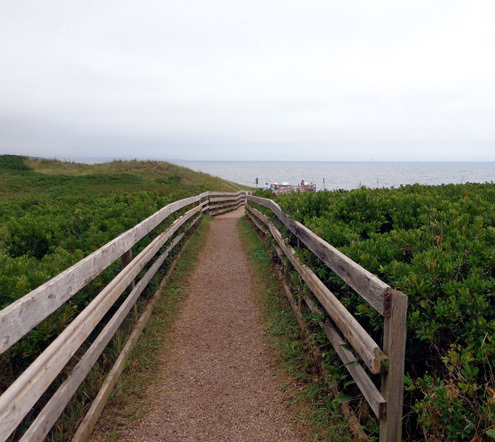 Some of the overlooks are adjacent to the road and have fencing to discourage folks from going down to the water. 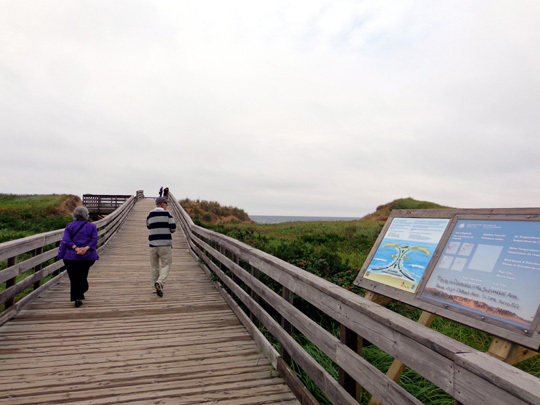 The boardwalk ends at a large deck with signs about the geology of the area, sand dune management, and tourism at Cavendish. Like the Brackley-Dalvay section of Gulf Shore Way, the bike path in this segment also runs right along the Gulf Shore Parkway. 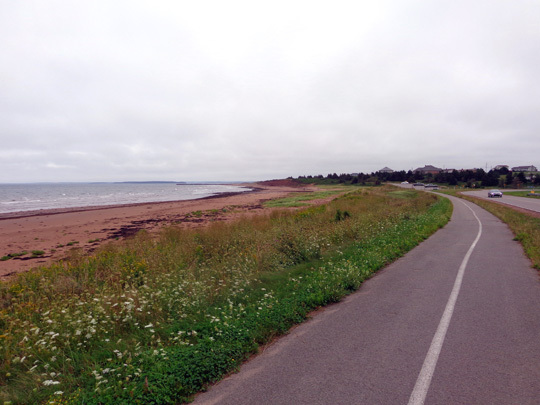 In this unit, however, the bike path stays on the ocean side of the road the whole way, giving even better views of the water. 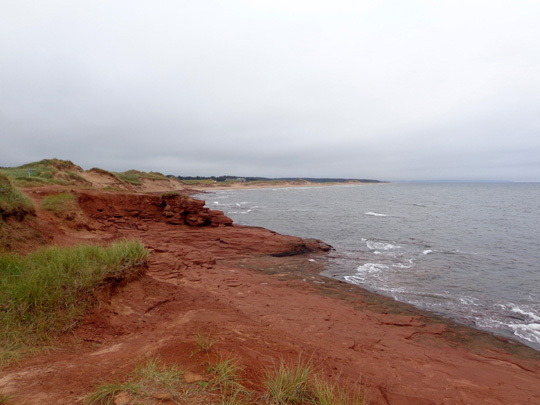 There were some other reasons why I liked this section better than the Brackley Beach to Dalvay section. 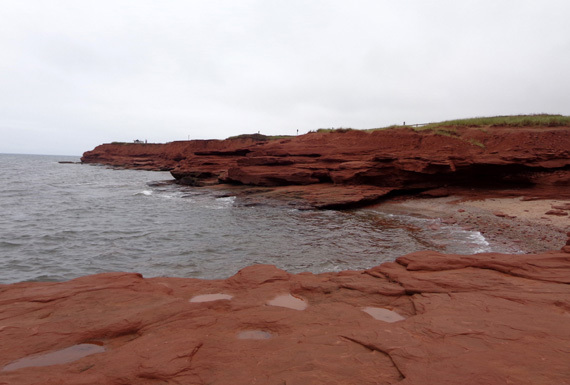 For example, it is more hilly and has lots of coves carved into red cliffs, as you can see from many of the pictures on this page. 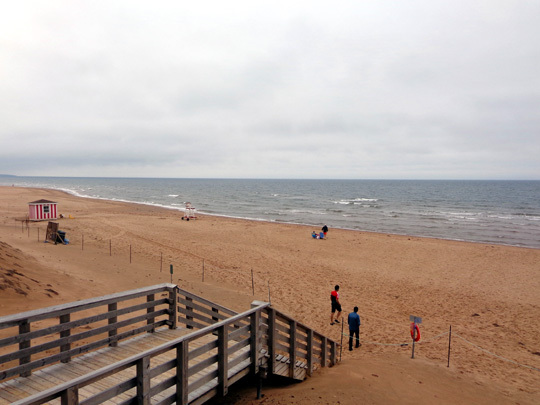 It's an advantage for the people who own property or stay there while visiting, for certain. I also saw the only lupines I've seen in bloom here in the Maritimes. Most of them were done blooming weeks ago. 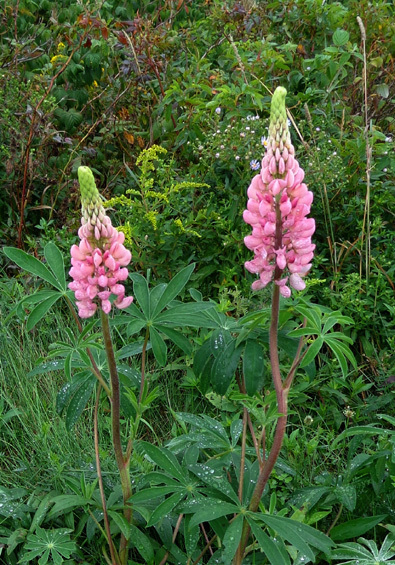 Since I found the lupines along the road near some houses they may have been planted deliberately. There were lots of other kinds of wildflowers in bloom along the parkway. 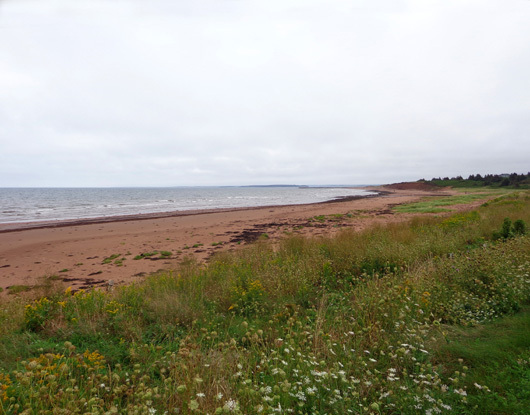 I came to an overlook with a good-sized parking area before I reached Cavendish Beach. 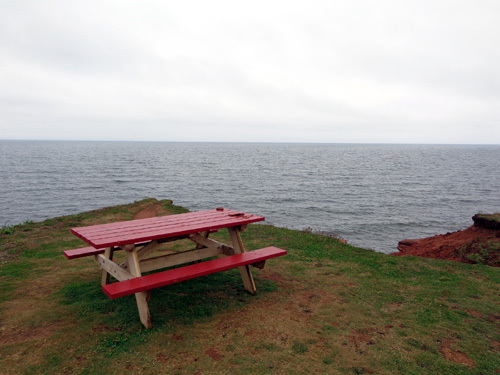 It had a picnic table and several interesting interpretive signs about the history of the Cavendish area, shipwrecks, and other sea stories. Soon after that I met Jim coming back toward me near the Cavendish entrance to the park. He heard there were trails at the other end of the park close to where we parked the truck and he wanted to check those out. Bye! 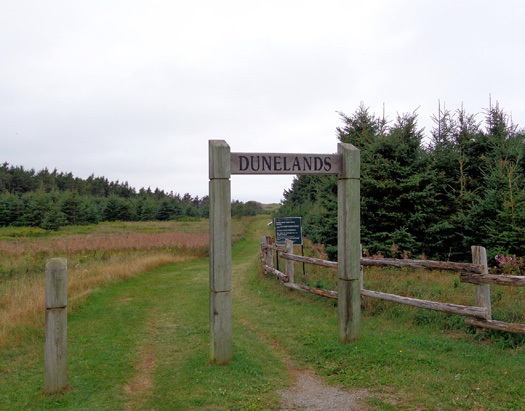 I continued westbound to explore some of the trails behind Cavendish Beach and the dunes. This section of Gulf Shore Way doesn't have as many dunes along the trail as Brackley-Dalvay. 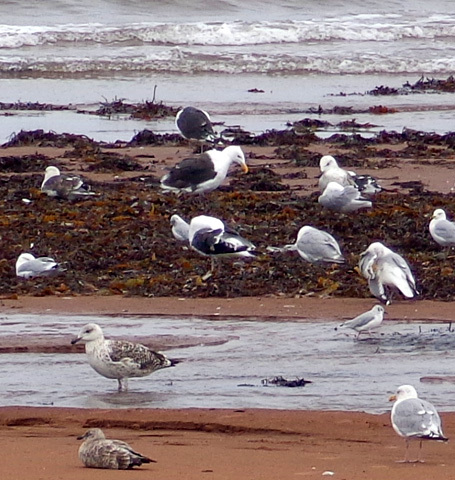 Instead, they are clustered at the western end of the park near Cavendish. 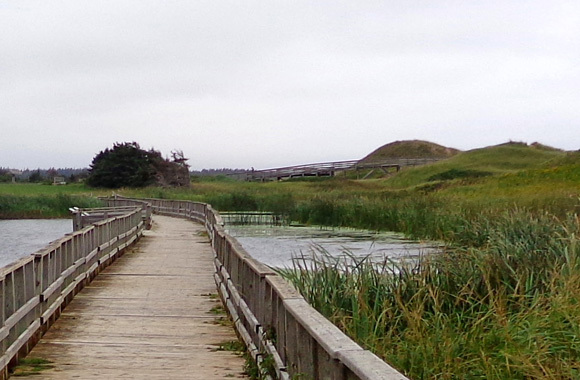 Above and below: The Cavendish Beach complex of buildings is in the background. 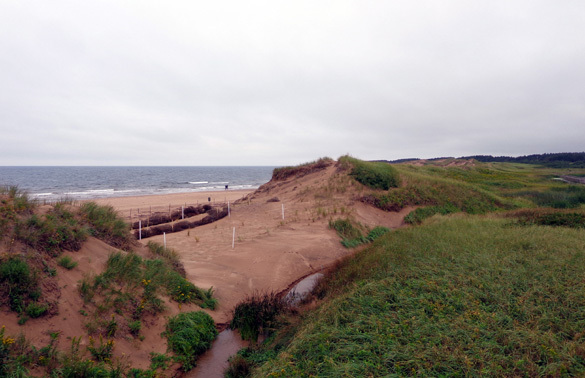 protection of the dune system is a top priority at PEI National Park. 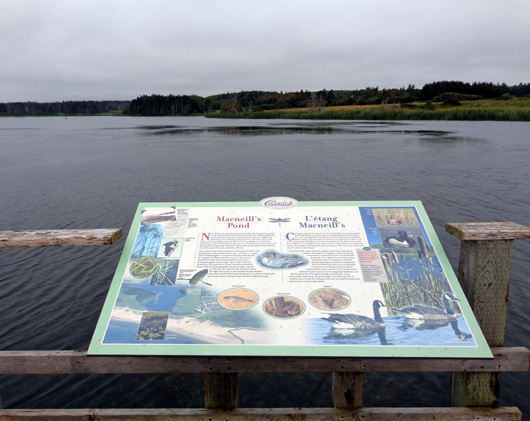 Mcneill's Pond is named for one of the Scottish families that founded Cavendish in 1790. 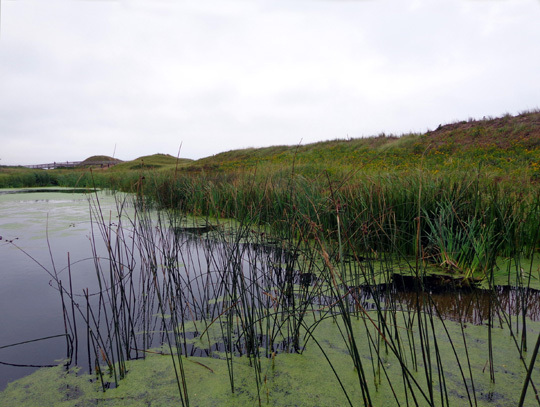 This pretty lake is like many others on the island that began as ocean coves but became fresh-water lakes after shifting sand dunes cut them off from the sea. 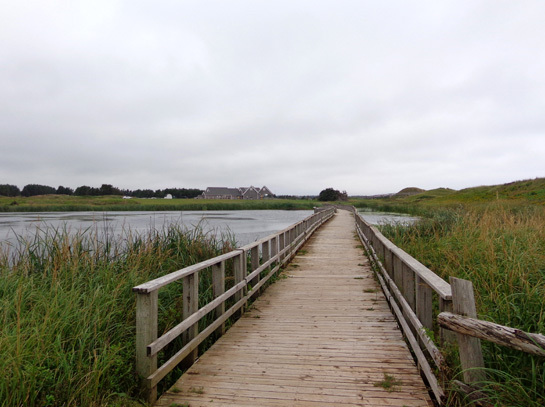 It is full of wildlife, migrating birds, and fresh-water plant life. There were several more miles of trails to ride in this area but I figured I'd better go back to the truck. As it was, it took me about 2 hours to ride about 13 miles with all the stops I made to read signs and take pictures. 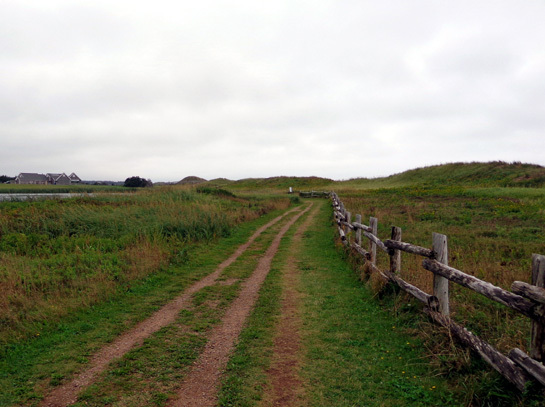 After Jim got back to the truck he followed the dirt road at the east end of the park as far as he could. 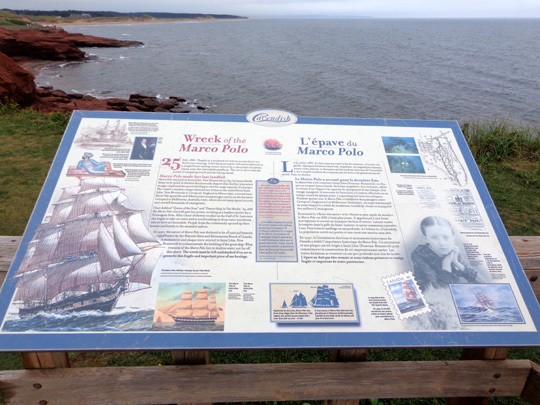 To our surprise, it comes out in Rustico Harbour near the Blue Mussel Cafe! We didn't know we could access the park from there. Jim wasn't able to find any other trails at that end of the park. He got done riding about 1/2 hour before me and did a little less mileage, which is unusual. On the way back home we got diesel in Winsloe for $1.38/liter CA, which is standard for PEI. We deliberately used up most of our Canadian cash, saving enough ($60) for the Confederate Bridge tomorrow and one load of laundry today. We have about $13 left. We can use it on the way to Alaska next summer. When we returned home we got things in order for our trip to Calais, Maine tomorrow. One task was to consume some of the food that might not pass U.S. customs. 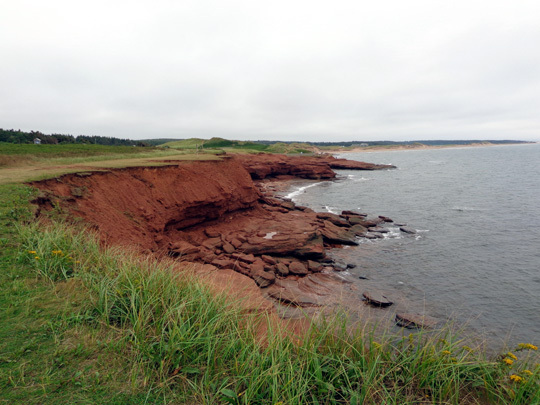 As thorough and annoying as the Canadian inspection process was when we came into New Brunswick a month ago, we had some fears of a repeat scenario going the other direction -- even though they didn't confiscate anything or charge any duty fees.